An element name is mandatory. It can be up to 20 characters in length, of mixed case and must be unique within the model. Either a data type or a field type and length is required. To specify a data type, select the Data type option and select an appropriate type from the drop-down list. For more information about data types, refer to 4. Data Types. 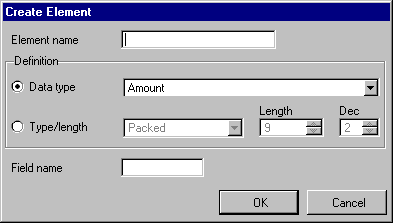 To specify a field type and length, check the corresponding radio button, select a type from the drop-down list and enter a length and number of decimal places if appropriate. A field name is optional. It will be the name of the field in the LANSA Repository when the element is built. It can be up to 9 characters in length, should follow normal field naming standards and must be unique within the model. Note that, at this point, the entry of a field name is optional – it is not required for the purposes of building the data model. However, it must be specified when building the entity to which it is attached. You can specify the field name using the 6.4.2 Change an Element dialog. If a field name is not specified when building the element, a build error for the element will be generated. Press the Cancel button if you do not wish to create the element. Press the OK button to create the element. Once it has been validated, the new element will be added to the Unattached Elements or Entity Elements list as applicable. The Create Element dialog will be reset to allow you to enter more element details. Press Cancel when you have finished creating elements.